My five-year-old son puts down the flashlight. In his latest game, he makes the light dart across the room so our crazy puppy chases it. However, our pup usually throws all 60 pounds of herself on me. At five, my son is still realizing that his actions have consequences. He’s constantly making mistakes and getting corrected – a totally normal part of childhood.. When kids see a character act poorly, make a mistake and then fix his behavior they can easily apply that to their own actions. It becomes a touchpoint – something that us parents can refer to again and again when we see our children acting a certain way. 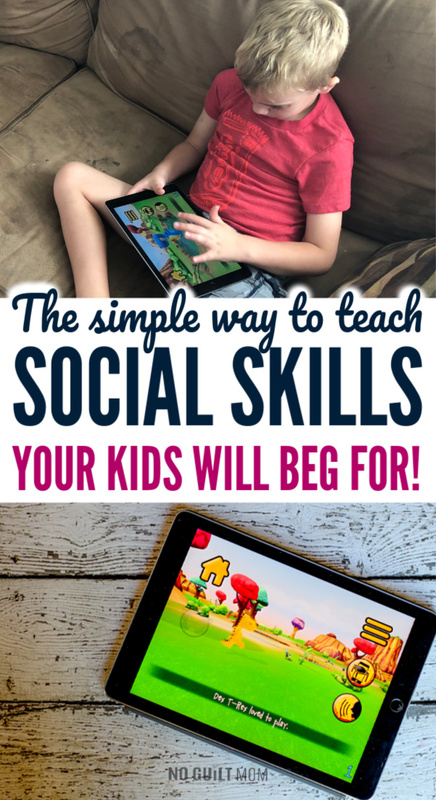 I’m really excited to partner with Playing Forward for this post because they have created a fantastic app to teach kids these social-emotional skills. An app to teach self control? My son agreed to try it out. We downloaded Playing Forward’s Stan Lee’s Kids Universe and met our rough-playing Dino friend, Dex T-Rex. Dex T-Rex is the first character for young kids created by Marvel Comics mastermind Stan Lee. Totally worthy of nerding out on. 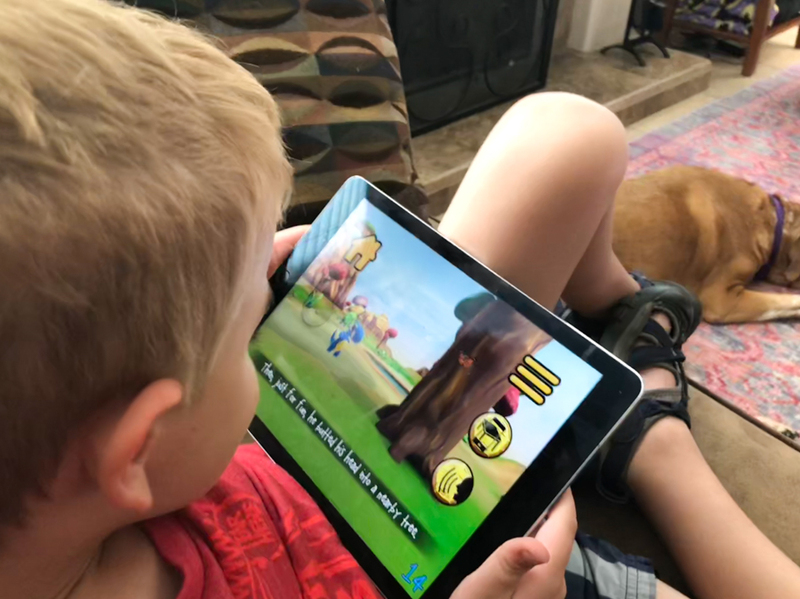 The app is an interactive story book that follows Dex T-Rex as he plays rough by breaking sticks, uprooting flowers and destroying everything in his path. You know, your typical four-year-old. The graphics are amazing in this storybook land. It makes sense since Playing Forward was founded by John Attard and Victor Talbot after many successful years creating visual effects in the entertainment industry. The duo even won an Academy Award for their work in Ridley Scott’s Gladiator. Since then, you’ve seen their work in Star Wars: The Force Awakens (Disney); The Jungle Book (Disney); Superman vs. Batman (Warner Bros.); Guardians of the Galaxy 2 (Marvel); and Avengers 3 (Marvel). You can either read Playing Forward’s Stan Lee’s Kid Universe as a bedtime story or your child can play the narration himself by pressing a button on the side of the screen. Want to see what this app can do? Before you download, know that this app contains one story that kids can read over and over again. Because, not only can you view the app in “book” form, but Dex can also break out into the real world. 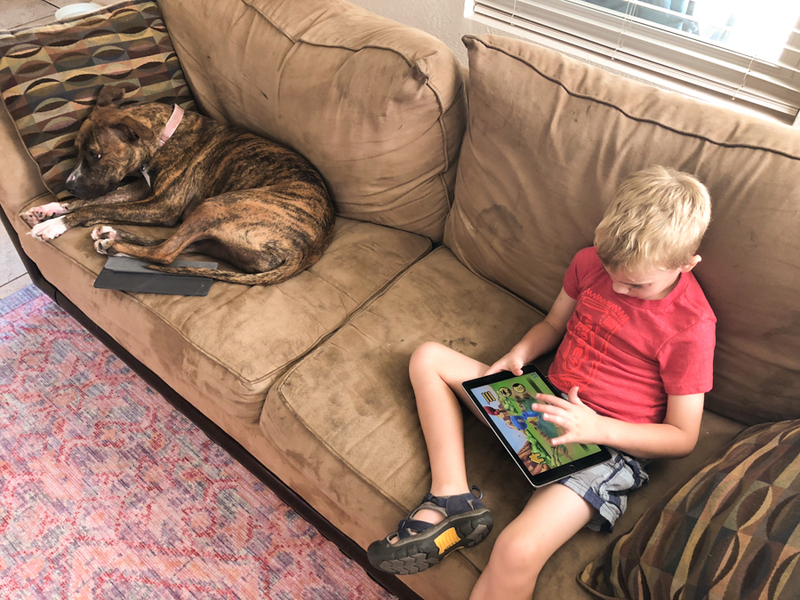 Using the camera feature on your phone or tablet, your child can make Dex cavort around the living room, break sticks on the couch or – my son’s personal favorite – on the dog. He replayed this story again and again making Dex act out in different locations. Since he enjoyed it so much, I was able to ask many questions to make sure he understood the lesson of the story. You see, Dex doesn’t notice the consequences of his actions until he pushes a tree and a little, baby caterpillar falls out. According to multiple studies, social emotional development is key to success in school and in life. Social skills and self control are even seen to be a key predictor in future achievement. Playing Forward apps are designed to support this growth through entertaining storytelling, movie-quality visual effects, and the use of Augmented Reality. And let me tell you, Playing Forward’s Stan Lee’s Kids Universe does this in a super fun way. 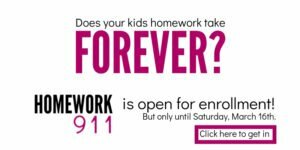 I recommend you download it right now and try it out with your preschool and early elementary school kids. Playing Forward wants to send you and your family on a STEAM-powered vacation of exploration and play in Manhattan. The Grand Prize includes air transportation, a two night hotel stay, a Visa gift card to cover meals, various museum tickets for a family of four. It will also include personalized experiences at two of Manhattan’s most unique museums – the Natural History Museum & the Children’s Museum of the Arts. Being aware of how your actions affect others is an essential skill for success later in life. You can help your child develop this skill through stories where the character makes a mistake and then corrects his or her actions. Playing Forward’s Stan Lee’s Kid Universe works perfectly because it is a story your child will want to read repeatedly. And if your child also prefers having Dex T-Rex play on your dog, I want to see pictures!